This edition of Dakar marks the second year of participation for India’s Hero MotoSports Rallyteam, the rally racing division of the world’s largest two-wheeler manufacturer, Hero MotoCorp. The Team had an impressive Dakar debut in 2017 with a 12th place finish of the Team’s ace Portuguese rider, Joaquim Rodrigues. An unfortunate crash at the half-way mark of the stage brought an abrupt end Joaquim Rodrigues’ participation in this year’s Rally. He was rushed to the hospital where initial scans showed no signs of any major injuries. He is now recuperating. Team Manager Wolfgang Fischer from Germany had mixed emotions: "We are all very sad with what transpired with Joaquim today. But no one can predict what happens at the Dakar. He is currently in hospital and being given the best possible medical attention right now. We are relieved that he is ok and on the road to recovery. The other two riders finished the day safely to remain in the competition. Our focus is now to get the best results for the team with the two remaining Heroes." Indian ace rider CS Santosh made a very good start on his fourth Dakar outing and closed the day with his best ever Dakar stage finish at 13th position. "What a day to kick-off the Dakar 2018," said India´s CS Santosh. "It was an anxious start for me being in the Peruvian desert as the short stages are always tricky. There were many way point controls but I am really happy to come back safely and achieve my best ever stage finish at Dakar. Now we work towards the next stages and take a moment to wish for a speedy recovery for our mate Joaquim Rodrigues." 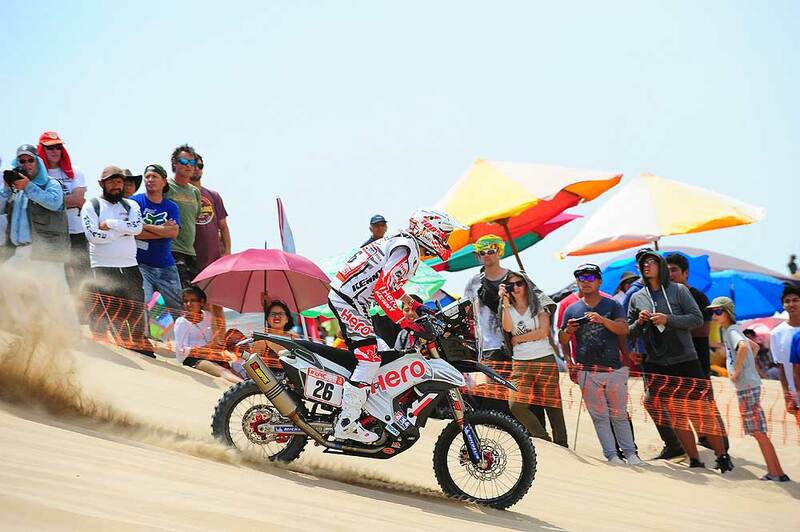 Oriol Mena made a cautious start to his Dakar dreams and finished at a stable 22nd position. "Joaquim’s crash was very unfortunate," he said after the stage. "The stage was completely in the dunes and the visibility was really bad due to high sun. It was difficult to judge better routes across the dunes as it was impossible to see the last part of the dunes. I wish for him to get well soon. For me, today was my maiden stage of the Dakar and I realise that it’s going to be a long and tough race. I opened the stage today and maintained my position throughout so I am happy with that. My aim is to finish every day and now I have one less day to finish." Dr. Markus Braunsperger, Chief Technology Officer, Hero MotoCorp and Head of Hero MotoSports: "It was exciting to see the riders start at the podium today. Joaquim Rodrigues’ crash was very unfortunate, but we are all happy that he is doing ok. We wish him a fast recovery and we hope that our remaining two Heroes will reach the finish line at Cordoba safely."